Memphis Tennessee is the seat of Shelby County and is in southwestern Tennessee. The largest city in the state, Memphis is located on the Chickasaw Bluffs overlooking the confluence of the Wolf and Mississippi rivers. Memphis covers an area of 255.9 sq mi. 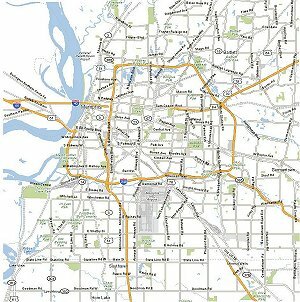 Located on the Mississippi River, Memphis is intersected by two Interstate highways and seven major U.S. highways. Memphis has a busy river port and many railroad connections also. Due to its location, more major metro areas can be reached overnight from Memphis than any other city in the central U.S making it a major transportation hub. It is linked to West Memphis, Arkansas, by two bridges across the Mississippi River. Memphis International Airport houses the corporate headquarters of overnight shipping company FedEx. As the commercial center of the Mississippi Delta, Memphis has a rich farming area known for its cotton market and soybean production, as well as being a major manufacturing center of textiles, heating equipment, pianos, and automobile and truck parts. Other products include processed foods, electronic equipment, medical implants and supplies, pharmaceuticals, and wood and paper products. A United States naval air station is nearby. Memphis is well known for its cultural contributions to the identity of the American south, including musical and culinary offerings. Many notable blues musicians grew up in and around the Memphis and northern Mississippi, and performed there regularly from the early 1900's onward. These included such musical greats as Muddy Waters, Robert Johnson, B.B. King, and Howlin' Wolf. The first African American formatted radio station, WDIA, was founded in the city in 1947 by Bert Ferguson and John Pepper, and included a young B.B. King as disc jockey. B.B. King's moniker was derived from his WDIA nickname 'Beale Street Blues Boy', a reference to Memphis' Beale Street on which many nightclubs and blues venues were located. For more on the Blues go to (http://www.memphistravel.com/). In addition to a rich musical heritage, Memphis also boasts a long culinary legacy dominated by regional barbeque. Memphis barbeque is rendered distinct by its sole usage of pork (as opposed to beef), focus on rib and shoulder cuts of meat, and multiple locally-owned barbeque restaurants. Celebration of this local dish reaches its climax each year in May, when the Memphis in May Festival (http://www.memphisinmay.org/) holds its annual international Memphis in May Barbeque Cookoff.